Heat oven to 350°F. Spray insides of 2 ovenproof 2-cup bowls with cooking spray. In 2-quart saucepan, heat soup, turkey, corn, peas, bell pepper and thyme to boiling, stirring frequently. Remove from heat. Into each serving bowl, pour half of the hot soup mixture. Carefully place 2 cheese slices in center on top of soup in each bowl. Place biscuits over cheese; spray biscuits with cooking spray. 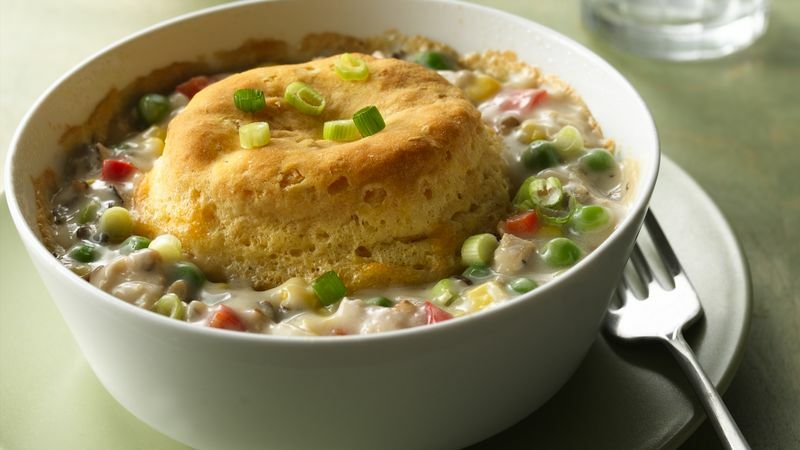 On cookie sheet with sides, place bowls; bake 38 to 43 minutes or until biscuits are golden brown and soup bubbles around edges. Cool 5 minutes before serving. Garnish with green onion. Add a little zip when you substitute Monterey Jack cheese with peppers for the cheese.